Make sure you get in 5 servings of fruits and veggies per day! Or is it 6? Or 7? What if I told you it was 1-3 servings for fruit.. But I thought fruit was healthy and you could never eat enough of it? 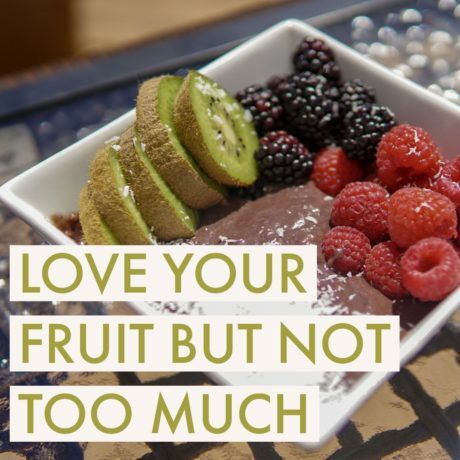 You take a fruit smoothie to-go on your way to work in the morning, eat a banana as a snack, an apple with lunch, and a big bowl of grapes for a movie snack when you get home. Or maybe that smoothie is your pre-workout fuel.. This all sounds nice, but unfortunately all is not as it appears. Carbohydrates are our bodies’ primary and preferred source of energy. This is our fuel. They help us lift heavier, play longer, and recover faster! In the human body, carbohydrates are stored as forms of glycogen in our liver and skeletal muscle. Glucose is the carb form we get from things like rice, potatoes, and other veggies. This is stored in our skeletal muscle and is the fuel we’re talking about for our muscles. Fructose is the carb we get from the sugar in fruit. This is stored as liver glycogen. Now I’m not saying cut out fruit. Fruit still packs a micronutrient punch and we need to be as diverse as we can in consuming those micros. You just have to manage when you’re eating it and how much.. Like I mentioned up top, 1-3 servings is the ideal range. The reasoning is that our livers have the ability to store around 100g of glycogen. Beyond that point, we store the excess liver glycogen as fat. That’s why we want to LIMIT our intake, not ELIMINATE it. Carbohydrates from rice, potatoes, breads, even some healthier cereals will do you better pre-workout. They won’t leave you feeling weighed down and they will help directly with performance in your workout. Don’t stop eating fruit, you need it! But it should not be the primary source of your carbohydrates. It won’t boost performance in the gym or aid in recovery, so avoid eating it around your workouts. Instead choose things like rice, potatoes, breads, and healthy cereals for workout performance. Fill the majority of your carbohydrates with veggies and whole grain choices!